Friends of the Pound Tweed, have a fun fundraiser planned this Christmas. Bring your dog along to have a Christmas photo taken with Santa. This photo shoot is for families and their pet dog (sorry no cats). The 5 x 7 photo, in a display folder, costs $15 and the money raised goes towards feeding the foster dogs and cats – a cost which adds up by the day. Santa hats off to photographer Ben Stevens for volunteering his services free of charge for the event. 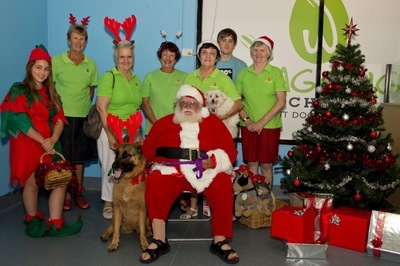 Friends of the Pound Tweed is a not-for-profit organisation whose aim is to "re-home homeless dogs and cats in the Tweed area and to improve conditions at the Tweed Shire Council Pound". The organisation is dependent on donations and fund raising efforts, so they are looking for support from the public to make this innovative fundraiser a success. The venue for the photo-shoot is the rehoming centre within 100% Pets (formerly Petcare Superstore), Greenway Drive, South Tweed. You can also check out the specials on the day at the store. 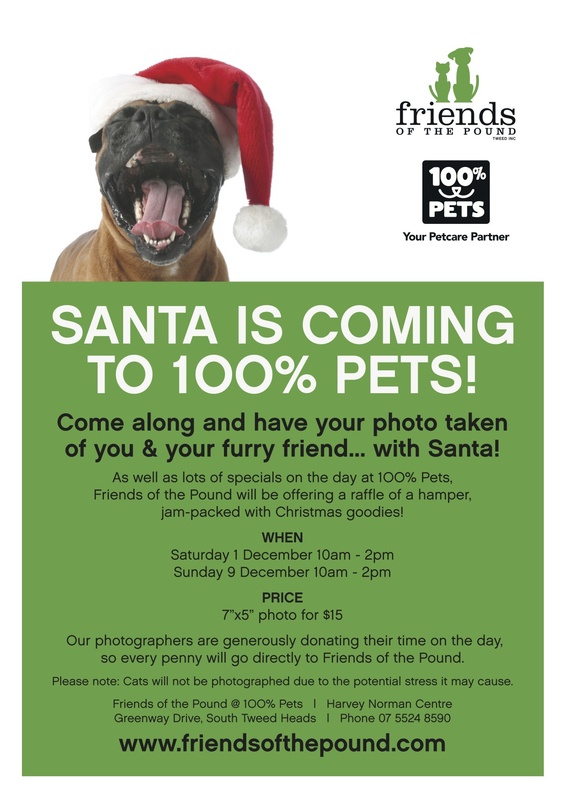 10 am & 2pm, and the big man in red will welcome your pooch for a pic. Let's face it; what's a family photo without your dog? Let them share in the holiday spirit too. It 's all for a good cause - your dog will give a gift to the pets in the pound, just by having their photo taken with Santa. Christmas is about giving so go along and do your good dog deed for the day.